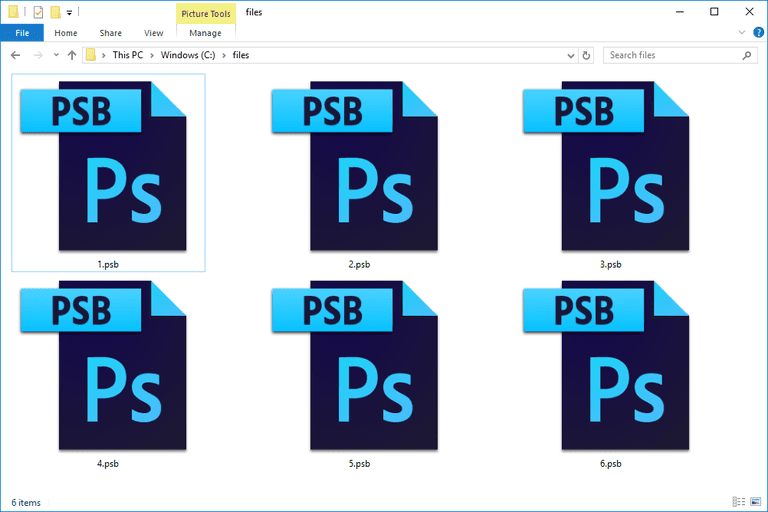 A file with the PSB (Photoshop Big) file extension is an Adobe Photoshop Large Document file. The format is almost identical to Photoshop's more common PSD format except that PSB supports significantly larger files, both in image dimension and overall size. More specifically, PSB files can be as large as 4 EB (over 4.2 billion GB) with images that have a height and width of up to 300,000 pixels. PSDs, on the other hand, are limited to 2 GB and image dimensions of 30,000 pixels. PowerDivX Subtitles files use the .PSB file extension too. They are text files used by the PowerDivX multimedia player as a format for saving subtitles. PSB is also an abbreviation for things not related to a file format, like PlayStation Blog, power signal box, public service broadcasting, program specification block, and polysulfide bromide battery. PSB files can be opened with Adobe Photoshop. If you find that an application on your PC does try to open the PSB file but it's the wrong application or if you would rather have another installed program open PSB files, see our How to Change the Default Program for a Specific File Extension guide for making that change in Windows. Photoshop is the best way to convert a PSB file to another format. It supports saving the PSB to PSD, JPG, PNG, EPS, GIF, and several other formats. You can also convert a PSB file without using Photoshop with a free file converter like Go2Convert. This website can convert PSB files to lots of formats, including not only those in the previous paragraph but also PDF, TGA, TIFF, and similar file formats. It should also be able to resize the PSB file before converting it. The only downside to using an online PSB converter like Go2Convert is that the upload file size is normally limited. You also have to both upload the PSB file to the website to convert it and then download it back to your computer when it's finished, both of which could take a while to complete. Any text editor can open PSB subtitle files since they're just plain text files, but a program like VLC is what you need to actually run the subtitles along with a video. Use VLC's Subtitle > Add Subtitle File... menu to open the PSB file. VLC supports other subtitle formats too, like SRT, CDG, MPL2, SUB, UTF, VTT, and TXT.